At the Uffizi Gallery there are some rooms dedicated to Flemish painting, which host works by great artists such as Hans Memling, Hugo Van Der Goes and other anonymous masters. From the 15th century trade between Florence and Flanders began. Many bankers moved to work in the major cities in Flanders, like Bruges, Antwerp, Ghent and Brussels, representing the great Florentine families. Many Florentine families commissioned works to the artists of Flanders. These works arrived in Florence and had a considerable influence on local artists. 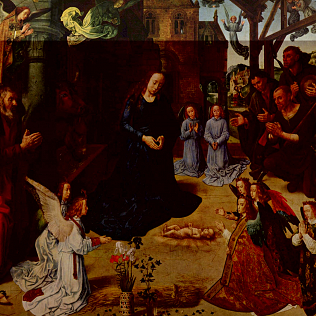 Many of these works are still in Florence, as the Portinari Triptych by Hugo Van Der Goes and the Madonna and Child with Two Angels by Hans Memling. However, in the past centuries, many of these paintings were released and now they are exhibited in museums around the world. Exchanges were also direct: Michelangelo and Luca della Robbia visited Flanders, while Rogier Van Der Weyden travelled to Italy. Through a new painting, Flemish and Florentine artists worked in order to reach a greater adherence to reality. Flemish painters focused on the meticulous reproduction of the details, while Florentines worked on perspective. Florentine painters were inspired by the use of light, the construction of the still life and the importance of the landscape in the background of paintings. Even the accurate reproduction of the elements represented – through plays of light and shadow - was very important for the Italian art of the 15th century. It is important to remember that the Uffizi have also a room dedicated to Rembrandt and the Flemish painters of the 17th century, which confirms the value of Flemish painters and how much Florence has been interested in collecting their magnificent works. Trade between two distant territories gave rise to important cultural and artistic exchanges and today we can still admire the marvelous artworks produced at that time.